Oh how I love a good hairbrush. And like the toothbrush, I sometimes become a nester in that I don’t notice when I need to replace it. So here’s a reminder for both of us! OLIVIA GARDEN Healthy Hair HH-3 Ionic Massage Hair Brush ($10.75 @ amazon.com) has a natural bamboo handle with an ionic cushion. 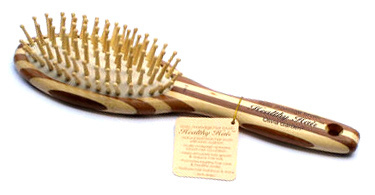 The bristles are wood so unlike plastic bristles, you don’t have to worry about them breaking and actually damaging your hair. And this one makes for a great scalp massager!